The Route 195 Redevelopment District Commission’s policy not to identify developers who propose buying public land is more secretive than policies of other state agencies. 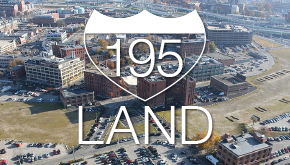 Without that information, Rhode Islanders will not be able to evaluate decisions by the commission to sell 17 parcels of land freed up for development by the relocation of Route 195. Other state agencies, including the State Properties Committee and the Department of Environmental Management, withhold bidding details while seeking buyers for state land, to maintain leverage in negotiations. But none reached by The Providence Journal has set policies to keep secret the names of losing bidders once a deal is struck to sell land. I can see where the Commission is coming from, but this Commission has to remain cognizant of the scrutiny they are under and leaning to the side transparency is in everyone’s best interest I think. Colin Kane nearly blew a vein when I asked a question at this meeting. Projo writer Kate Bramson tweeted this. Apparently the meetings are ‘open’ but not ‘public’. That guy should check his blood pressure at the door. There’s a real need to know about issues like parking (hopefully less not more!) and other features. Also, Kane pretty much precluded any potential questions about the garages, the geometry of these two-lane one-way deathtraps the Commission is planning on the infill streets, etc. I ran into a commissioner at another event, and that commissioner said privately that Kane is bright but frequently out of line. It seems that there’s no shortage of appointed commissioners of any sort who feel that their charge is to rule their fiefdom and that they forget that they are actually representing people. Who pay taxes. Who make investments in a place and have a vested interest in its success (or failure.) but instead these commissions up thinking that they are somehow above all that. At least politicians who are ELECTED pretend to care what “the people” want.